The guided hiking tour of Meteora is one of the best ways to enjoy the unique landscape of the Meteora rocks and learn the history of the place which is listed as a UNESCO World Heritage Site. By joining this morning hike you will get the chance to see many things other visitors will never see, because you will be guided through ancient trails that only the locals know of. You will get to the footsteps of the first hermits and monks who originally arrived there more than 15 centuries ago, in order to experience Meteora like never before. The hike will start on the foot of the Doupiani rock, right beneath the old ruins of Pantokrator monastery. From there you are going to cross the massive rock pillars of Meteora towards the northern side of the rocks, following a trail that leads to the hidden monasteries of Ypapanti and the ruins of St. Dimitrios, which in the early 19th century became part of a battle during a local uprising against the Ottoman Turks. Take this hike and learn all about the secret stories behind each place through the exciting narratives of local mountain guides. From that point and after a short walk you will find yourself gazing at the impressive monasteries of Great Meteoron and Varlaam which are located on a higher level, with enough time to spend for a visit in one of them. The hike will then take you downhill through the ancient trail of the monks that is still paved today with the original stones and you can walk under the shadows of the massive rocks for the last part of this marvelous hike. A group hiking experience that you will never forget. The group consists of 12 people per group. The guides are fluent English speakers, and per request you can have a french or italian speaker. The duration of the activity is 5 hours, with 2,5 hours average walking time. The walking pace depends on the group's abilities, but most frequently is average. 2 people attendance minimum requirement. 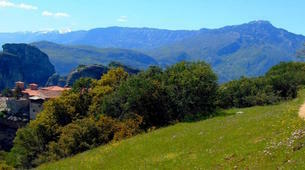 Entrance fees on the 2 monasteries of Great Meteoron and Varlaam are not included in the price. The entrance fee is 3 € per person, per monastery. There is a limit of 12 people in this small-group hiking tour. In case you are a bigger group you will be split into smaller groups, with more guides ensuring you will receive personalised attention. Respect the holiness of this site, keep it clean and seek the right balance between tourism and spiritual activities. You have to be at least 6 years old to participate. 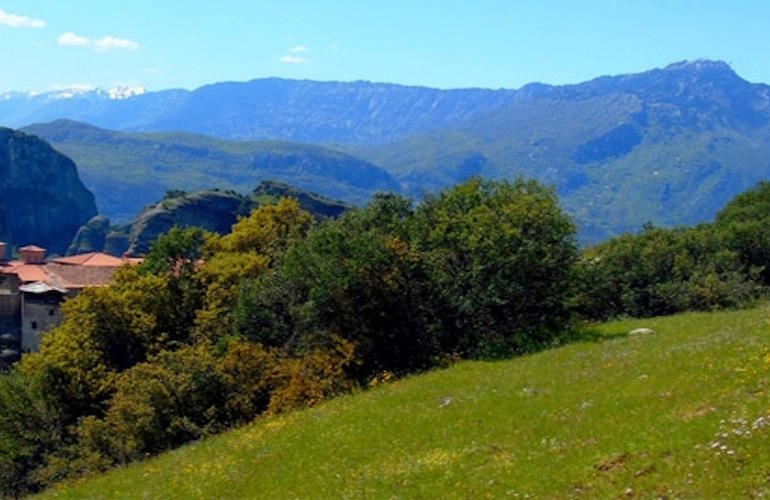 A Private Hiking Guided Tour to personalise according to your expectations and abilities. You can choose a more compelling hiking trail as you want and the route can be customised to your needs.